Writer-director Alejandro González Iñárritu’s rich history of plumbing the depths of human misery hits bottom with “Bituiful,” a wrenching portrait of a hustler and devoted father trying to get his affairs in order before he succumbs to the cancer racing through his body. Operating on the fringes of Barcelona’s black market, Uxbal (Javier Bardem) is a fixer/enabler/go-between—he doesn’t exactly engage in illegal activity or exploit people, but brokers deals between cops and street vendors, illegal immigrants and construction foremen… taking a small slice of several pies. He augments his meager income by serving as a go-between for the recently deceased and those they’ve left behind. Yes, he talks to the dead. 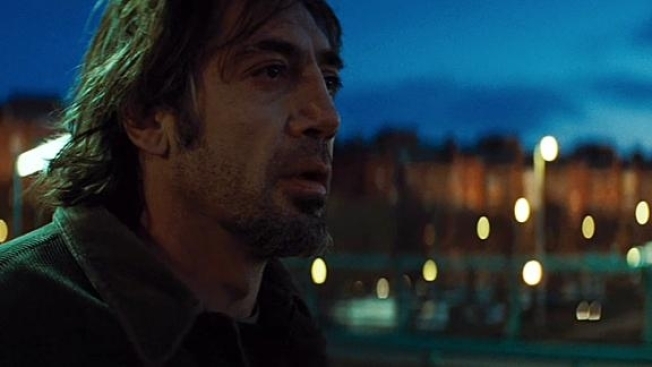 Bardem delivers one of the best performances of his career, showing a depth and range that is rarely called for. Whether he’s talking to the dead, spurning or chasing his estranged manic-depressive wife, or grieving the two dozen deaths for which he feels responsible, Bardem brings you along and makes you believe. Complicating Uxbal’s preparations for his kids is the reentry of his estranged wife Marambra (Maricel Alvarez), a manic-depressive masseuse with a too-strong taste for alcohol, men and corporal punishment. Alvarez, a dancer by profession making her feature-film debut, lets it all hang out in her turn as a bedraggled mess desperately grasping at straws. Alvarez admiriably switches from glee to rage to sorrow, as the role of a manic depressive requires. Like a joke that goes on and on, eventually becoming unfunny and then funny again, “Biutiful” will drag you down, then leave you numb only to ratchet up the depression to a miserable crescendo, before letting you up for just the tiniest bit of air. If the film has a weakness, it’s perhaps the overly ambitious scope of Iñárritu’s vision. At one time or another, the film touches on immigration, corruption, psychopharmacology, depression, the afterlife, parents and children, closted homosexuality, guilt, disease, health care… He doesn’t give anything short shrift, but one can’t help but think he could’ve sharpened his focus. Iñárritu’s direction is impeccable, as his camera slithers through the streets and back alleys of Barcelona. The rich colors, the washed out moments, the recurring darkness hanging overhead, Iñárritu uses them all to enhance the mood, rather than set it. “Bituiful” is a relentlessly bleak film offering a sliver of hope, made bearable---if not fun—by the collaboration of two world-class talents.